Top Trenz : Top Trenz, Inc is owned by 2 thirty something brothers, Corey and Jamie Glassberg. Our Long Island office/showroom is located in Bayshore, NY and have numerous showrooms in the United States including NYC,Arizona,Texas, Florida, Los Angeles, Atlanta, Canada, South America, Italy and now in France. 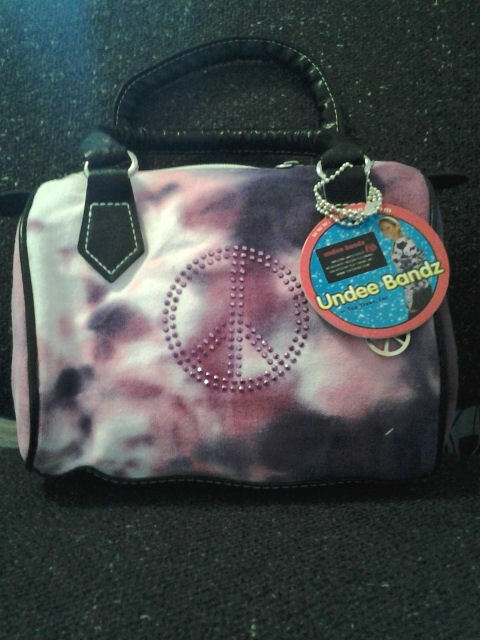 We are on top of the latest trends and are the proud creators of the exciting UNDEE BANDZ tie dye line of all categories of bags, fashion accessories, hair accessories and clothing line! We can assure our customers that we will continue to keep on top of what is hot for the upcoming seasons! I loved everything on Top Trenz.com it was so hard to decide what I wanted to review, they have everything tie dye you can imagine, and even cute stuff that isn't tie dye that I loved. Everyone loves tie dye in the summer, but who says dye die can't be a fashion trend in the fall and winter? Top Trenz has colors that you can't resist but to wear in the colder months, like the Zip up hoody tie dye shirt with crystal applique that I will also be reviewing. The kids will all the talk when they show up for school with the rad tie dye 3 ring binder ($7.50) , or the very cute tie dye insulated lunch box ($25.00). I unfortunately don't have children of my own, so I live through my nieces and nephews. My youngest niece (Ivy) is now a pre-teen (11) and acts more like me than her mother, and is into the same things that I was when I was her age. So when I found the Top Trenz website and they had all these really cute, and adorable tie dye hand bags and hoodies, I knew she would fall in love with these. 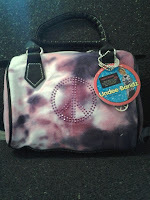 I chose the Tie dye Handbag ($25.00) color code (TD08) a pink, white, and purple tie die colors, the front of the purse has a really cute purple studded peace sign design, which gives it a little bit of cuteness and a fashion statement. Perfect for girls who are now in middle school (6th grade) they have stash their schooling products such as pencils, rulers, markers, little note pads, and (unmentionables) if they need it. My niece is getting to that age where fashion is everything, she want's to dress hip like her friends, and purses will soon be her go-to acessory for school besides her already love for (shoes). Her friends will be so jealous when she comes to school with her matching tie dye peace sign purse and hoodie. And I will remain her favorite aunt of all times (Score one for me). Besides the obvious that the purse is super cute! and the purse is a perfect size for starters, every purse comes with a free silver peace sign necklace (awe) the last time I seen her she gave me a silver peace sign necklace for a present, and now I will show up wearing mine, and she will have her own, she will love knowing the fact we have matching necklaces now. The fabric is soft, but very sturdy made and 100% cotton, great for young girls who wear and tears everything they own. The fabric is also easy to clean with just soap and water. The inside has a zipper pocket, perfect for chapstick, or lipgloss. Both ends have faux leather tongues, easy for gripping for opening, and closing of the top purse zipper. faux Leather purse handles for ease of carrying, and grip. I can't wait to see the look on her face when she see's what her favorite aunt has got for her. (Picture soon to come). ♥ You can find Undee Bandz on Facebook - Here. - Like us on Facebook and get 5% off your next order (can not be combined with any other offer or discount). ♥ You can find Top Trenz on Facebook - Here. ♥ I receive no monetary compensation for this review. I was provided a purse to try and give my honest opinion.